Wireless dog fence – the truth – do they work? Wireless dog fence – is this an easier solution? What’s the buzz about a wireless dog fence? When considering installing an electronic dog fence one of the factors will be “do I need to install a boundary wire? A wireless dog fence seems like an easy solution. No boundary wire to dig in, just plug in and go! For over 40 years the electronic dog fence has been used to keep pets safe. Traditionally this involved digging or installing a circuit of boundary wire to keep the cat or dog contained. The idea of simply plugging in and going seems so much easier so why are these fences not more popular? 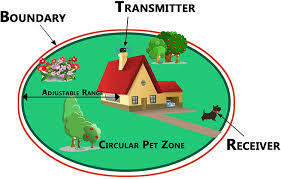 The wireless dog fence involves installing the transmitter into centre of the property. From central transmitter a circular signal creates the no go zone around the garden. 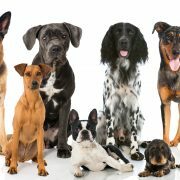 Sounds simple enough, however, the downside is that property owner needs to consider several major facts when looking into wireless dog fencing. The wireless fence works be creating a circular zone around the boundary. A Wireless dog fence may not suitable for narrow properties – the property needs to be 30ft wide min. Terrain challenges: The lay of the land may not be suitable. A wireless dog fence is not ideal for sloping or terraced gardens. Heavily wooded areas can interrupt the signal. Similarly metal objects and fencing can grossly effected the signal leading to dead spots. This happens with all AM electronic dog fences. 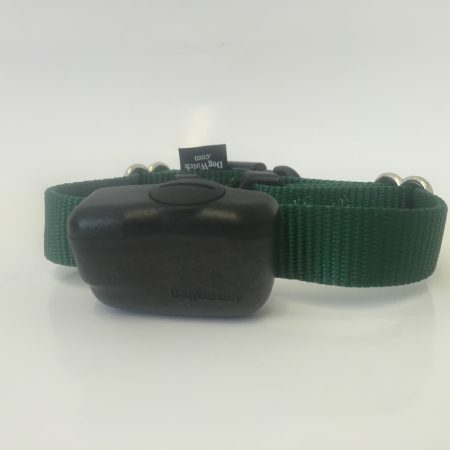 A wireless dog fence collar cannot be worn indoors as is prone to activation from objects within the house – TV’s and dimmer switches as well as other household appliances. 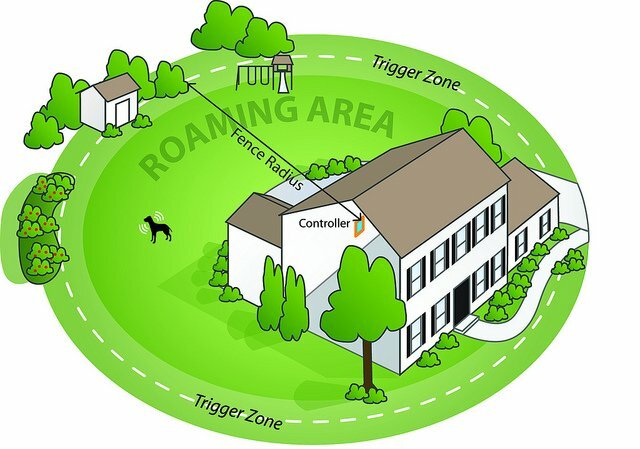 Fence wobble – the boundary with a wireless dog fence fluctuates so the dog boundary will change causing confusion/danger to the dog .With some systems the Wireless Fence wobble can be up to 16ft. A wireless fence cannot be used with houses that have a mobile phone signal booster or smart meter. 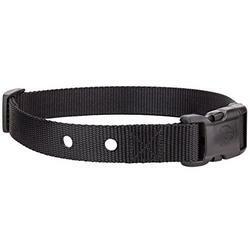 The Wireless dog fence receiver collar is heavy and bulky and not really suitable for small dogs or cats. Does not give adequate warning if the pet enters the zone. The wireless fence does work for some owners. It would be fair to say that this product is probably more suitable to US houses where the house is on an open plan flat plot. For UK households most gardens are already fenced and the wireless dog fence is a backup. 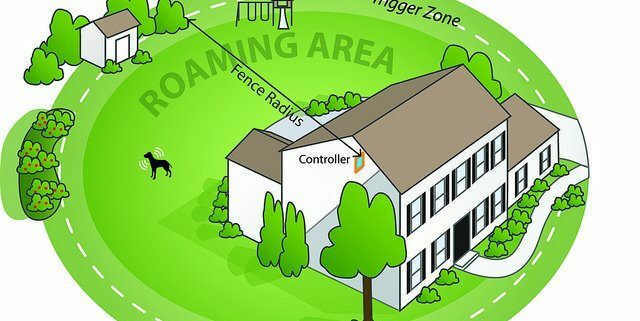 With US houses the wireless fence may be the only containment parameter. If the zone does not cover every inch of the property it is not quite so crucial. 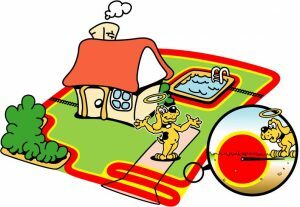 With a UK garden if the owner has a fence running around the boundary and the installs an interior circular zone this is confusing for the dog. Also if the owner is prepared to remove the computer collar when the dog enters the house this would make the wireless fence a good option. 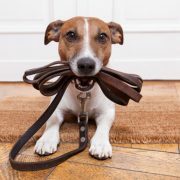 Most owners will agree that boundary wobble is unfair for the pet the if the wireless dog fence is being added as a secondary fence it may not be quite such an important issue. No boundary wire to lay – so cable cannot be damaged. The wired fence can be used to cover irregular boundaries even on undulating terrain and can create inner loops to cover pools or play areas. The advantage that a wired dog fence has over the wireless fence is that it can be used for any shape of property, on any terrain. 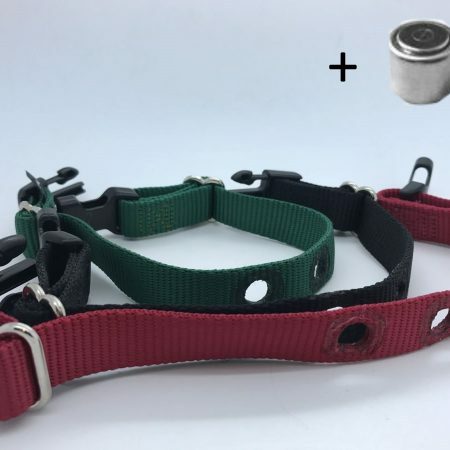 Also the FM systems* guarantee no false activation on the pets collar both internally and externally so the collar can be worn both inside and outside. Different technology within the wired fences enables the size and weight of the collars to be far smaller and lighter. 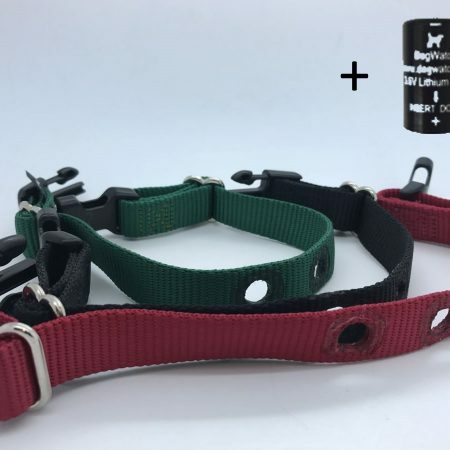 Collars used for wireless dog fences are heavier and bulkier due to the antenna and batteries. 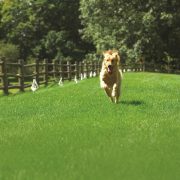 *Dog Fence UK are the only electronic dog fences worldwide to us an FM signal. A wired dog fence can be installed on any terrain and can cover irregular shaped or undulating boundaries. If an FM system is used there is guaranteed no false activation on the collar. Boundary is consistent – no mixed message for the dog. 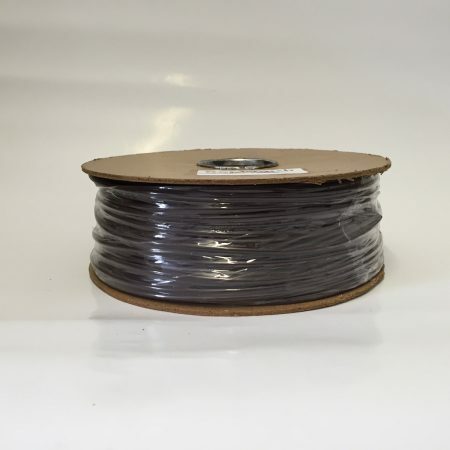 Can cover a larger area – up to 6km of boundary wire (350 acres). 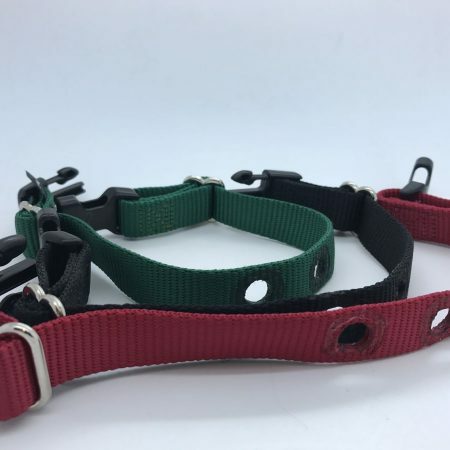 Collars are smaller and lighter (suitable for all breeds and cats). Always gives an audible warning. Not as easy to move from house to house. Since this blog was originally written the criteria for the installation of both wired dog fences and wireless dog fences has changed in the UK. 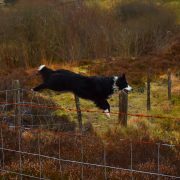 New Government legislation to be introduced shortly requires that all electronic dog fences need to be professionally installed with training. We are currently waiting for the Governments position regarding wireless dog fences. Both wireless dog fences and wired systems will contain most pets but it is worth researching before purchasing to avoid making a costly mistake. 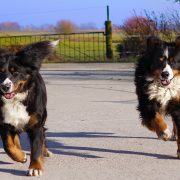 The training time for both wired and wireless dog fences should be the same and this will be dependent on the size of the area, age and breed of dog. 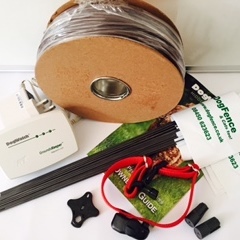 Should you wish to talk to one of our experts regarding an electronic dog fence installation please call us on 03450 623 623 or email us @ info@dogfence.co.uk. 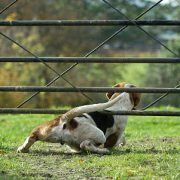 www.dogfence.co.uk.